Marconite is the world’s premium electrically conductive aggregate material – the synthetic material is manufactured specifically for use in earthing applications and unlike Bentonite, it is not a naturally occurring mineral or ore.
Marconite enables electrical earthing system designers and installers to achieve permanent, stable and low resistance earthing solutions, even in difficult ground conditions when used as a backfill to enhance the effects of copper earth electrodes or earth rods. Specifically developed and manufactured for the needs of the earthing industry, Marconite has allowed engineers for over 40 years to tackle the toughest conditions and achieve the satisfactory earthing of installations including substations across the globe. When mixed as described above Marconite forms a relatively dry material with an ‘as poured’ density of around 1300 Kg / m³. The water content may be adjusted as the application requires but this will affect the concretes final compressive strength and the drying times accordingly. Typically, Marconite concretes are touch dry within hours but can be several days before being fully cured. Marconite is also available in the form of a ‘premix’ – this is a standard 25 Kg poly sack which contains pre-weighed amounts of Marconite and cement powder in the correct ratio to form the preferred concrete. With the addition of 5 litres of water each bag can then be mixed independently and used without the need to carry additional cement powder. Marconite is a granulated electrically conductive aggregate which replaces sand in mixes with cement, thereby providing electrically conductive concrete. Other earthing materials marketed as conductive aggregates include low grade carbonaceous by-products from other industries which include coal, metallurgical coke, power station clinker, carbon black, Bentonite and others. All of these products can be called conductive with resistivity of 5 ohms metres. The resistivity of Marconite is in the order of .001 ohm metres. When mixed with cement the resulting conductive concrete is still only 0.19 ohm metres. This is significantly lower than Bentonite for example, which has a typical resistivity of 3 ohms metre upwards. Typically the above products can include anything between 15-20% impurities which are corrosive and will corrode earth connections resulting in the loss of the system which can prove to be very, very expensive. The compound has no such impurities and at PH7 is non corrosive and is manufactured specifically for earthing, it is not a by-product. Example: So a 100 x 100cm hole (1 cubic metre) would need 40 bags of Marconite PREMIX to fill it completely. Assuming there are no other components in the hole absorbing some of the volume of the hole. Towers used for power distribution, lighting and communication aerials are usually supported on foundations with each leg on an individual concrete base or all legs on a reinforced concrete slab. Earthing is traditionally completed with earth electrodes using conventional earth rods or tapes. A. Marconite conductive concrete has a resistivity of 0.1 ohm metre. 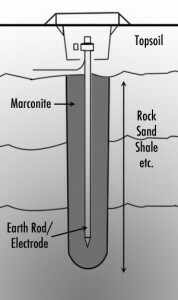 B. Marconite can be placed as a blinding layer when excavating the foundations and connected by copper tape to the tower. C. Bore holes are not required thereby reducing drilling and copper costs. D. By incorporating a blinding layer with the foundation block the area available is considerable when compared to a single electrode, enabling the resistance required to be achieved. Substations are earthed to contain any fault current within their boundaries. At the perimeter Bore Hole with Marconite is constructed all around i.e if 20Mtr Bore Hole is done – then next one will be done at 20Mtr distance. This is done all around the perimeter. A 100mm dia bore hole with a 16mm copper rod encapsulated with Marconite has a large area of dissipation that will ground any fault current faster and more safely when compared to a 16mm dia rod. To complement Earthing & Lightning Protection products.